In the wake of the Franco-Prussian War (1870-71), Belgium realized how vulnerable it had become to invasion from either France or Germany. In 1880, King Leopold II charged Belgian engineer general Henri Brialmont to draw up plans for defense of the country. The result was a plan to build a ring of 12 forts around Liege and another nine around Namur, which lay astride the main invasion route. Additional forts were also planned for Antwerp to supplement those already built in response to the threat posed by Napoleon III in 1859. By 1890, the forts were completed and Belgians felt secure within their three great fortress rings. The forts held impressive armament. This included 57mm quick-firing canon to 150mm cannon and 210mm Howitzers. The heavier cannon and Howitzers were placed in armored cupolas designed to protect them from high explosive shells. Each of the larger forts had a garrison of some 500 men, including infantry..
Design Flaws. But, the design and geographic placement of Brailmont's forts had weaknesses, particularly as the chemical explosive compounds and the metallurgy for shells improved. 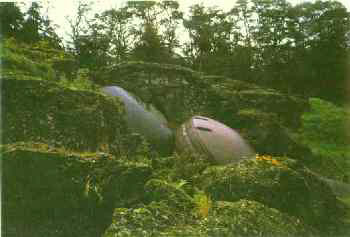 First of all, the turrets were vulnerable when in the raised position. Moreover, the triangular and polygonal shape of the forts and their surrounding dry moats served to concentrate the heavy guns in a central citadel position, which increased their vulnerability. 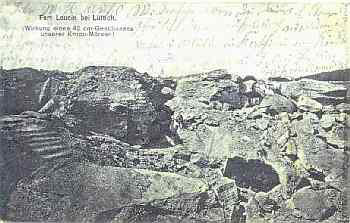 The damage done by a single shell at Fort Loncin is illustrative. The Belgian method of mixing and pouring concrete represented another flaw. The concrete was poured in two layers, which lessened its resistance. Some sources also assert that Belgian concrete mix was of quality inferior to that used by French contractors during the same period. In any event, the three meters of concrete protection called for by the Belgian design proved insufficient. Significantly, unlike the French post-1870 fortifications, the Belgian forts were not constructed of reinforced ferroconcrete. And, unlike the French forts, they were never modernized between 1890 and 1914 to keep up with improvements in artillery. Tactically, the two fortress rings of Liege and Namur had no way to support each other. There were no permanent interval position constructed between the forts themselves and the individual forts at Liege and Namur were not sited so as to be mutually supporting. Same general area of the fort today. Note the dismounted turret in both photographs. 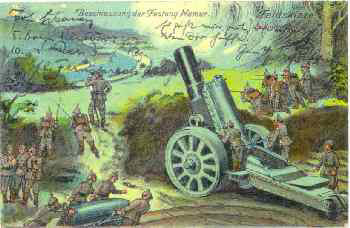 A direct German shell hit detonated the fort's magazine, killing 500 men of its garrison. The German Attack. When they attacked in August 1914, the Germans surprised the Belgians, overran the ring of forts at Namur in four days and, passing through gaps between forts, rapidly occupied Liege on the Meuse River. When heavy guns arrived, the Germans reduced the Liege forts one by one using 21cm Skoda mortars and, later, 42cm Krupp "Big Berthas". Fort Loncin was one of the last to fall, being destroyed August 15 when its magazine blew up after being penetrated by a German round. Over half of the fort's garrison of 550 men were buried beneath the ruins of the fort, which was never rebuilt in the inter-war period and remains a memorial to these Belgian dead. The Impact of the precipitous fall of the Liege and Namur forts was both immediate and longer term. The immediate effect was to free up the supply lines from Germany to support the massive wheeling movement of German armies into France under the Schlieffen Plan. More importantly, the failure of the Belgian forts to stop the Germans convinced the French to abandon plans to use their own fortress system, which led to near disastrous results at Verdun in 1916 as these forts were stripped of their heavy guns and their garrisons re deployed. J. E. Kaufmann and H. W. Kauffman, Praeger, 1997. The contemporary photo is by the author and the postcards are from his personal collection.